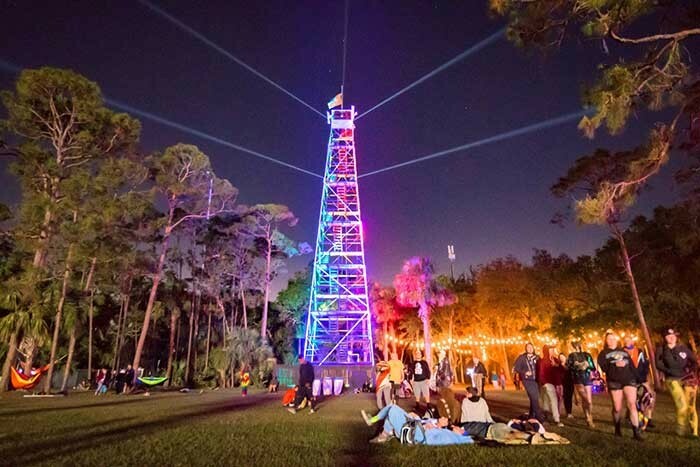 USA – 1st to the 4th March saw the third incarnation of the Okeechobee Music & Arts Festival, a four-day multi-genre music experience filled with art and entertainment held at Sunshine Grove in the heart of the Florida wilderness. The festival’s recipe of offering a range of diverse talent (this year saw Arcade Fire, Bassnectar, Halsey, Travis Scott, The Flaming Lips, Snoop Dog, and Khalid among many others) attracts a wide range of music fans. Rob Ross, site lighting designer for the festival and president of Rob Ross Design, Inc., designs and oversees the installation of the site lighting at the festival and chose to highlight one of the most important symbols of the festival in dynamic lighting, a can’t miss 90-foot tall fire tower. 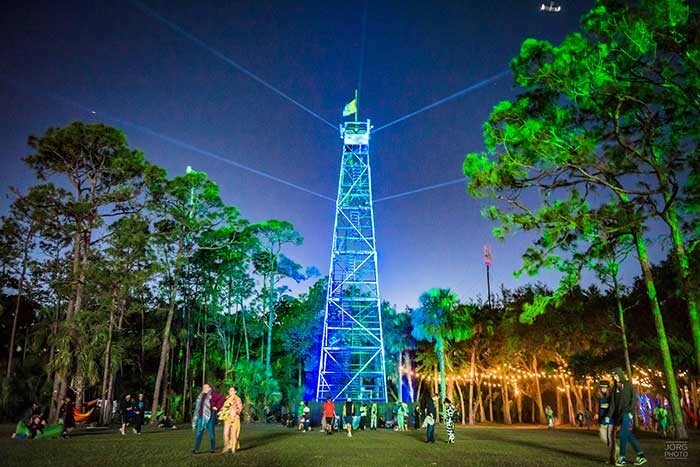 The fire tower, which displays prominently in the festival’s branding, including website, posters, pamphlets and site map, can be seen from across the festival grounds and therefore serves as a gathering and meeting spot for guests. The Paladin is an IP65-rated hybrid LED luminaire with zoom that functions as a brilliantly bright blinder, powerful strobe and high-output wash light. Its 24 40W RGBW LEDs kick out a full spectrum of colours, including high-impact white light. Ross used the fixtures to create a wide range of looks on the tower, including a rainbow effect pulsing around the tower and a white strobe effect. 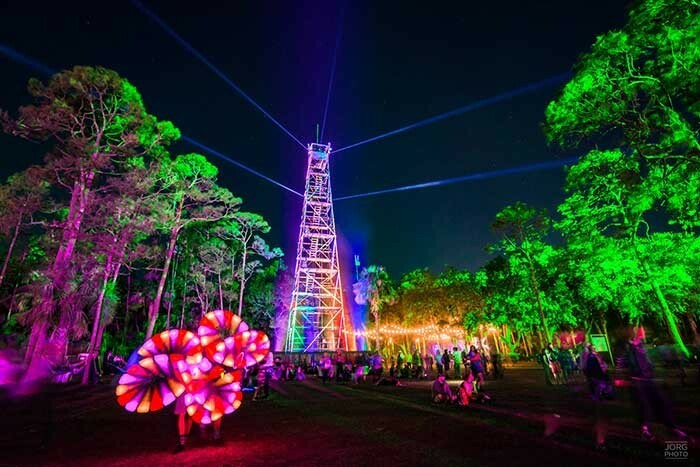 In one special look, Ross created a static rainbow around the fire tower with colours blending as one moved up the structure, ending in an extremely bright white on the top cabin of the fire tower. Because it has multiple pixel zone control, the Paladin can be pixel mapped for easy video design integration or can be used for eye candy looks. It also includes a manual tilt adjustment that allows for more flexible positioning for more accurate projection. 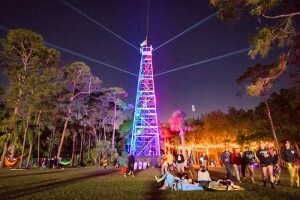 “What was really great is that these fixtures are cost effective enough that we were able to use 16 of them at the base of the tower, in a project where our budget is spread across an entire festival site,” Ross said, adding, “It’s a delicate balance deciding how to spread out the gear.” The lighting rig was programmed by Rob Ross Design’s lead designer, Alejandro Fajardo. Ross began using Elation lights about six years ago when he started working with The Design Oasis on some of their site lighting projects. 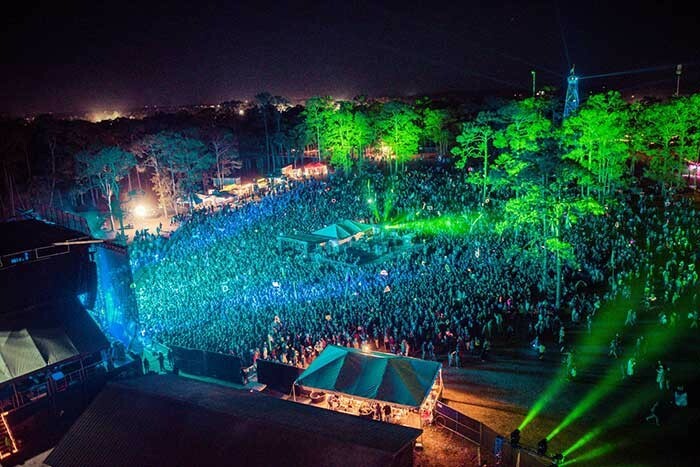 He again called on the full service cross-rental company to support his team for the Okeechobee Music Festival. “The wonderful team at The Design Oasis has supported us throughout much of our work. Their encouragement and dedication have allowed us to continue creating successful designs, despite any technical or logistical difficulties,” he concludes.